I am not sure if I said this before, but I love winter time baking. The flavors are so rich and just layers upon layers of spice are to be found in so many sweet delights. Perhaps my love of Gingerbread Cake has a lot to do with my love for winter, but I do love the cold weather too, so for me it’s a double win. 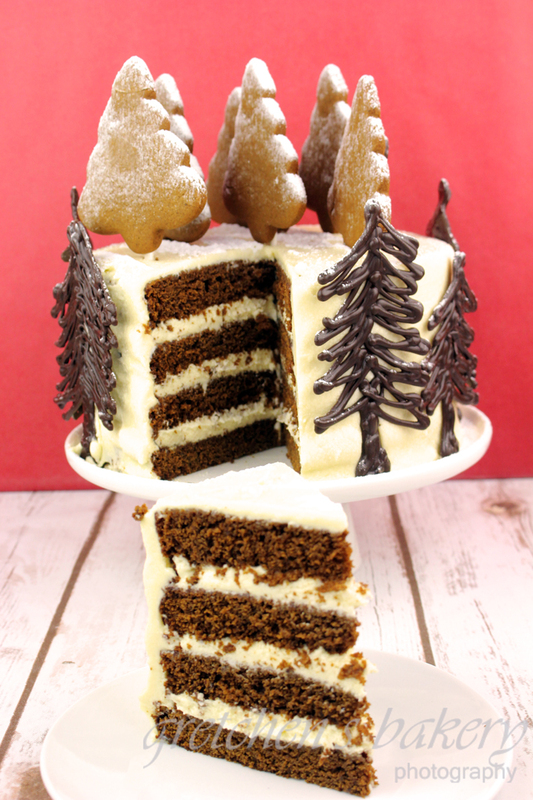 Imagine this luscious moist winter wonderland gingerbread cake loaded up with cream cheese icing and a hot cup of vegan hot chocolate on a cold snowy winter night!? 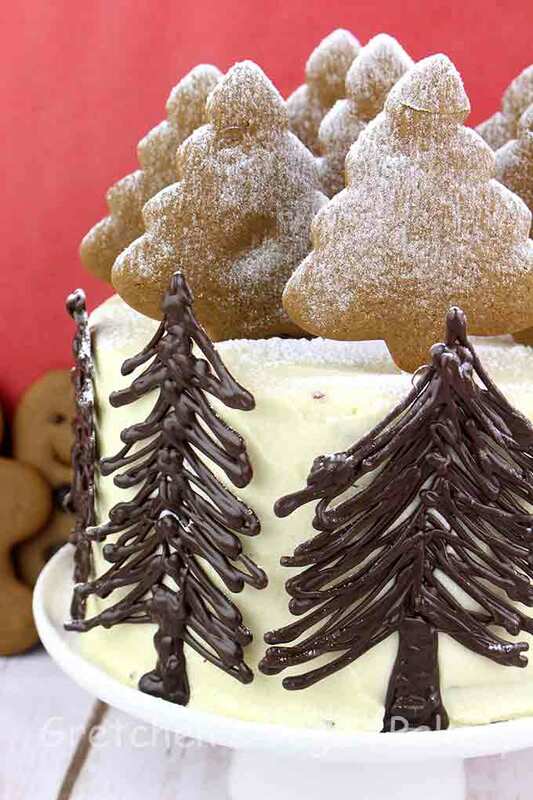 With a crisp gingerbread man cookie to dunk along the way! So actually, stop imagining it! MAKE IT! 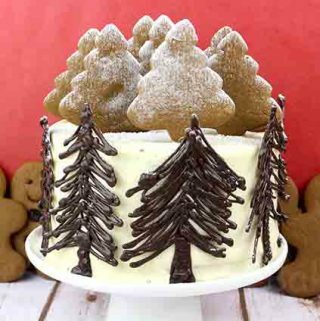 Of course the gingerbread men and tree cookies and I used for decor are completely optional but how else do you get a winter wonderland scene without that little cutie standing in a forest of gingerbread and chocolate trees? I had so much fun with this one and I know you will too! PS- this is another sneak peak recipe from my new book: Modern Vegan Baking now available on amazon! For this icing I added a bit of my aquafaba swiss meringue buttercream to it, but this is an optional step. If you prefer straight up cream cheese icing go for it! Add the molasses to the creamed butter mixture and mix well, scrape the sides of the bowl and then add the flax paste and vanilla extract. Once out of the fridge you must re-roll this dough. Mash it all together and knead it back together, then RE-roll on a floured work surface until it is pliable. In the meantime, cream the softened vegan butter with the light brown sugar on medium -high speed until very light and fluffy, about 3-5 minutes. Add the flax paste to the creaming vegan butter and sugar mixture, and mix well. Pour the batter into 2- 7" greased and parchment lined pans and bake immediately in preheated 350° F oven approximately 30 minutes or when they are springy to the touch when you gently press the centers. Cool the cake layers in the pan then turn out onto a cooling rack to cool the rest of the way while you prepare the cream cheese icing. Thanks! Im so glad you loved it! Me too!! I think it will work just fine for a wedding! Knife dipped into hot water before slicing will help it out too! Could I possibly adapt this recipe to fit 3 6inch cake tins? do you know of a way I can adjust the ingredient amounts? Thankyou! I just tried making this and my cakes sunk in the middle 🙁 didn’t open the oven during cooking or anything. Any idea why this happened? Hmm Im sorry this happened, my first suspicion when I hear that cakes sink is that the pan was too small or the batter was overfilled? Is this possible?